5.5% CAP rate. The Chelsea Arts Tower is Manhattan's first art gallery condominium situated in the heart of the Chelsea gallery district. The sleek glass and concrete, 20-story, class A commercial building was developed by Young Woo Associates, Jack Guttman and designed by award-wining firm Kossar + Garry Architects in 2006. The building was designed to house exclusive luxury spaces, art galleries, and select art-related businesses. For over a decade the building has evolved to welcome additional lines of business such as fashion showrooms, event spaces, and PR companies. The Chelsea neighborhood is also home to various tech firms including Google and other notables such as Twitter, YouTube, and Uber. The building features a reception desk staffed from Monday through Saturday, two passenger elevators, and an oversized freight elevator with a capacity of 8,000 lbs. There is 24/7 keyed access, high speed fiber optics, and state of the art security. There are currently 13 well-known occupants in the building spanning the 21 floors. Five of those thirteen businesses have a presence that spans multiple floors. Some notable occupants include Marlborough Gallery, Tina Kim Gallery, Calvin Klein Studios, FLAG Art Foundation, and Joan Mitchell Foundation. 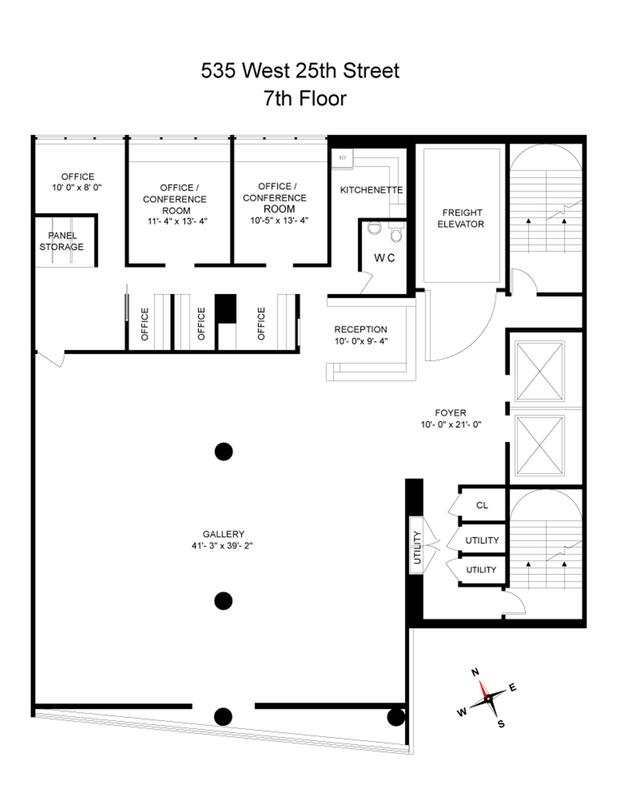 The 7th floor is currently home to a private office with 4,140 SQFT thoughtfully divided into gallery and supporting office space. The floor offers floor-to-ceiling windows, exceptional light, polished concrete floors, centralized HVAC, 11' ceiling height, and a contemporary design by award-winning interior designer Clodagh. Chelsea's residential and commercial real estate landscape continues to grow, in part due to Google, We Work, and the Hudson Yards Redevelopment Project. The Chelsea neighborhood is home to more than 200 art galleries and is an ideal location for a business seeking an open, dynamic and creative space to inspire their employees. The building's proximity to luxury residential buildings, the High Line, the Fashion Institute of Technology, the newly opened 7 subway, numerous outstanding restaurants, and bars makes it a desirable location for any business looking to settle in a vibrant area of New York City.